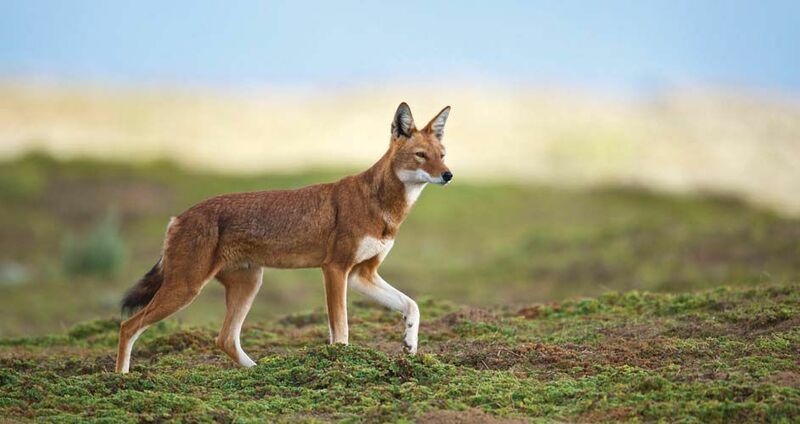 High in the mountain meadows of Ethiopia live one of the world’s most endangered and rare canid, the Ethiopian Wolf. These elegant, long legged wolves, similar in size to the coyote, have become Africa’s most endangered carnivore. With approximately 500 wolves remaining in seven isolated populations, protecting these rare canids has thankfully become the passion of Dr. Claudio Sillero, who is known for his carnivore conservation projects spanning four continents. 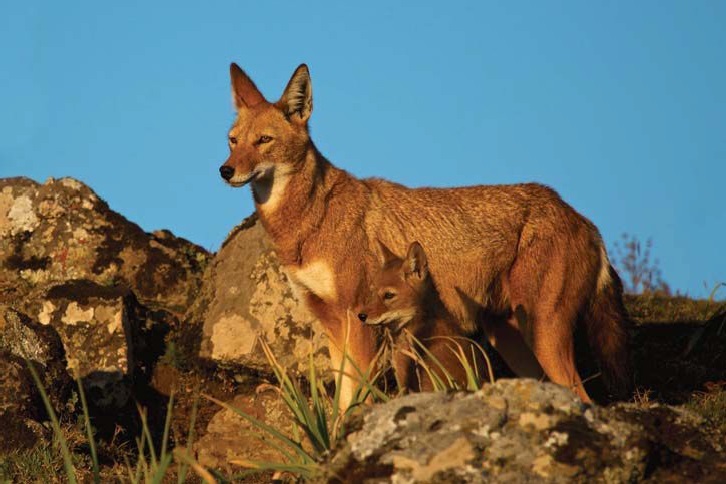 In 1995, he founded the Ethiopian Wolf Conservation Program (EWCP) which he continues to focus on today along with other projects as a Zoology Research Fellow at Oxford University’s Wildlife Conservation Research Unit. Dr. Sillero recently visited Houston, through his relationship with the Houston Zoo, to participate in the zoo’s “Call of the Wild” speaker series where he presented information about EWCP. Houston PetTalk took the opportunity to meet Dr. Sillero and interview him about his important conservation work. 1. Ethiopia’s expanding human population – The wolves make their home in mountain meadows at elevations above 10,500 feet where subsistence farmers are tilling the land, making this area some of the most densely populated agricultural areas within Africa. Human encroachment means the wolves are isolated to smaller and smaller areas, thus habitat degradation and new roads increase road kills. 2. Domestic Dogs – Posing the greatest danger to the wolf is the domestic dog that transmits diseases such as rabies and possibly canine distemper. Wolf populations were decimated by such outbreaks in 1991 and 2003 reducing the wolf population in the Bale Mountains from 440 to 150. Domestic dogs also contribute to hybridization of male dogs mating with female wolves, thus endangering the genetic integrity. 3. Direct Persecution – The wolves are often blamed for livestock killings (although in reality this is rare) and are poisoned or hunted. With his many years of research, education and work, Dr. Sillero and the EWCP are focused on alleviating the aforementioned threats to Ethiopian wolves by monitoring their numbers and protecting the areas where they live. He notes that scientific research is the foundation for EWCP’s conservation actions and through their studies, they have unveiled the behavioral ecology of these fascinating wolves, with their complex mating and social systems, genetics, etc., thus fueling them with knowledge on how to protect the species. In response to the threat from domestic dogs, EWCP vaccinates domestic dogs to effectively control the spread of disease. EWCP has focused its vaccination campaign on dog populations in and surrounding wolf habitat in the Bale Mountains. The Bale Mountains is a critical area because high domestic dog densities overlap with an important wolf range. Indirect advantages of dog vaccination include public health and safety and reduced livestock losses. It provides a valuable opportunity for community liaison and environmental advocacy. And finally, EWCP created a comprehensive education campaign for local school children and employs many local residents, raising the standard of living and fostering a strong conservation ethic among those who most closely co-exist with this rare carnivore. EWCP’s Education Team visits local schools and distributes educational materials, currently reaching over 3,000 children per year. Dr. Sillero notes, “Having the rarest carnivore is unique and we have captured the passion of national pride by playing on that uniqueness and getting the citizens to rally around the conservation of this rare animal that is important to the biodiversity of the region.” Through continued efforts, Dr. Sillero and the EWCP hope to maintain today’s number of Ethiopian Wolves but in order to achieve that goal, they need help from conservation minded supporters. To continue the effective programs they have initiated EWCP needs donations. 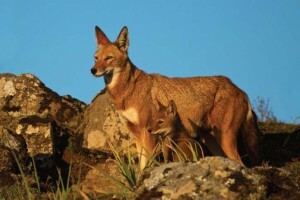 100% of your donation can be designated to the conservation of a WCN-supported species, including the Ethiopian Wolves. Designated contributions go to support community-based species conservation programs. TO DONATE: Visit www.ethiopianwolf.org to make your donation. Every dollar matters! About Photographer Rebecca Jackrel; Rebecca Jackrel is a freelance photographer based in San Francisco, California, who shares her love of wild creatures and places through her photography. Rebecca has been honored for achievement through the 2010 Nature’s Best Photography Awards, 2010 National Wildlife Federation Photo Contest, the 2009 Nature’s Best Photography Awards, 2008 Art Wolfe International Conservation Photography Awards, 2007 Art Wolfe Environmental Photography Invitational, NANPA (North American Nature Photographer Association), 2008 Marin County Fair and the Orange Audubon Society of Florida. Rebecca is a member of NANPA (North American Nature Photography Association), ASMP (American Society of Media Photographers) and PPA (Professional Photographers of America) and lectures on nature photography and environmental issues.